Calf Training Like A Beast! Muscle-Specific Hypertrophy Workouts! Be a beast and use this specialized calf hypertrophy workout. Build huge calves and learn a little anatomy while you are at it. Get ripped now! Workout includes seated & standing calf raises and toe raises. Before starting on the muscles of the lower leg, there are a few bones that should be known: The femur (large bone of the upper leg), the tibia (medial, weight bearing bone of the lower leg), the fibula (smaller, lateral bone of the lower leg), and calcaneus (the "heel" bone). Each group of lower leg muscles performed as a specific task. The anterior muscles are dorsiflexors at the ankle (bringing the top of the foot towards the leg) and extensors of the toes (lifting the toes off the ground). The lateral muscles evert the foot (lift the lateral side off the ground). 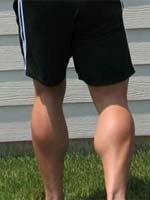 The gastrocnemius is the most prominent and superficial muscle of the calves. This large posterior muscle has two heads: medial and lateral. The medial head of the gastrocnemius originates on the posterior distal femur, near the medial condyle. The lateral head originates on the posterior distal femur, near the lateral condyle. Both of the heads unite at about midway point of the lower leg into the calcaneal tendon. The calcaneal tendon, commonly referred to as the Achilles tendon, then inserts into the calcanius bone. The soleus lies deep (right under) to the gastrocnemius. The soleus also has two heads, though not as pronounced as the gastrocnemius&apos; heads. The medial head originates on the posterior tibia and the lateral head on the posterior fibula. These two heads unite and insert into the calcaneal tendon. The primary function of the soleus is plantar flexion of the foot. Unlike the gastrocnemius, the soleus does not cross the knee and has no action at that joint. Because of this, when the knee is flexed, the gastrocnemius is at a mechanical disadvantage and the soleus must perform complete plantar flexion. Now you may look at this program and think, "There is nothing special to that." And you would be correct in saying so. The basis of this program is to pound the calves heavily with a heavy weight and low reps then follow up with HIGH rep sets. The Best Calves On The Forum! This is a showcase of all those forum members that are genetically gifted or those who had to earn every inch on their calves. See some amazing calf production straight from the forums. Decrease the weight you use and focus on a full stretch and contraction during EVERY rep.
Do not bounce the weight. Instead pause for 2-3 seconds at the bottom of the movement before beginning the concentric phase of the lift. Perform for a VARIETY of rep ranges as the calves are composed of both fast-twitch (primarily found in the gastrocnemius) and slow-twitch (primarily found in the soleus) muscle fibers. 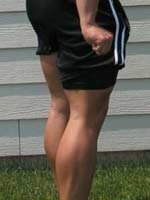 Try performing your calf raises without shoes on (A popular method). Derek "The Beast" Charlebois is an ACE certified personal trainer, competitive bodybuilder, and holds a Bachelor&apos;s degree in Exercise Science from The University of Michigan.